Moscow-city is Russia's largest construction project downtown. The complex is located in Krasnopresnenskaya area of Moscow, Kozhevnicheskiy pereulok. On-site business center has an observation deck, and the complex itself is pretty impressive. 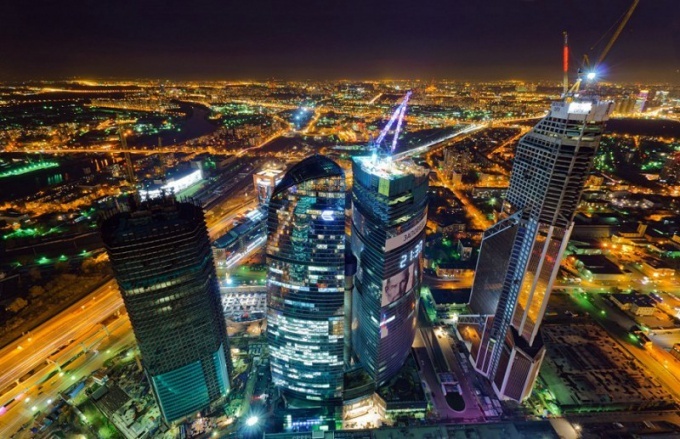 You can use the tour of Moscow city, which is offered by several travel agencies of the capital. Will tell you about the construction of the complex will show interesting places in its territory, including the world's tallest musical fountain and a tour of the tower "Federation". MIBC (Moscow international business center) was built on the site in 60 hectares. it consists of several tall buildings-towers. Two of these towers are rented for offices, and another one is a hotel and residential apartments. The Center has a number of different shopping areas, banks, beauty salons, shops and other entertainment and service organizations. In the direction of the business center "Moscow-city" is laid with an individual branch line. It starts at the metro station "Kiev" Filevskaya and branches off from the line. You need to catch a train to the station "international". You can exit at the stations "Exhibition center" and "international" - both with easy access to Moscow city. Branch is marked in blue, you can get to it with the hub "Alexandrovsky sad-Arbatskaya-Smolenskaya-Kievskaya. To Moscow-city can be reached by bus using the route that you want to stop "Derbenevskaya". Address MIBC – 2 kozhevnicheskiy pereulok, 7a. The bus to the stop "Derbenevskaya" walking from several metro stations: Marksistskaya (route 106), "Serpukhovskaya" (No. 632), "Paveletskaya" (routes of buses №106, 13, 632, bus No. 13m), "Taganskaya" (No. 106). Many visitors to Moscow are interested in visiting the observation deck. It opened in the spring of 2014 on the 58 floor of the "Empire". With deck offers excellent views of Moscow state University, the Academy of Sciences. University, the Cathedral of Christ the Saviour, the White house and many other interesting sights of Moscow. Go to the observation deck alone is impossible, but you can do it as part of the tour. While working sites: from 17:00 to 21:00 on weekdays, and from 10:00 to 21:00 on weekends. The rise is the Elevator, which moves at a speed of 7 m/sec. Tickets cost up from 300 rubles (the cheapest option). To register in advance. This can be done on a special website devoted to the observation deck: Smotricity.ru. You can also call by phone +7 (499) 272-48-46. Mistakenly believed that the only large and conveniently located shopping centre within the ring road in Moscow alone – and it's "European". Although just one metro stop away is another center of a giant- "Afimall city", within which is also quick and easy. As the global crisis has broken plans "APIMELL"
However, the long-awaited opening was solemn and was attended by many Russian pop stars: Dima Bilan, group "Factory" and "band'eros". 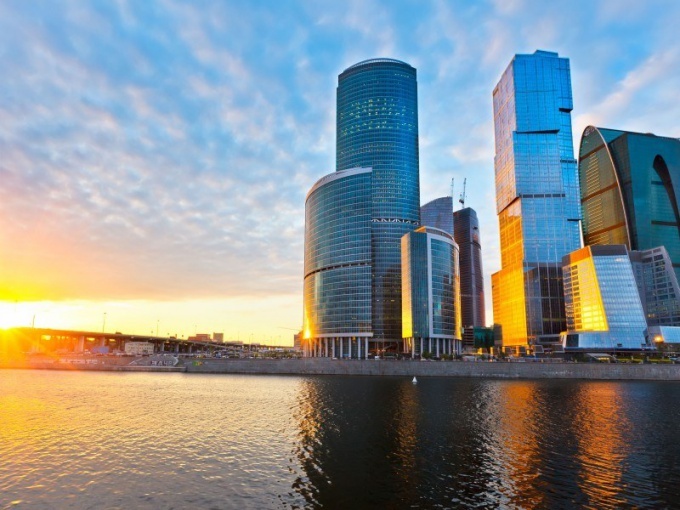 Unlike most of its competitors, the property is not within the boundaries of the Moscow ring road, but much closer – in the center of one of the largest investment projects of the last decade, the Moscow international business center "Moscow city". 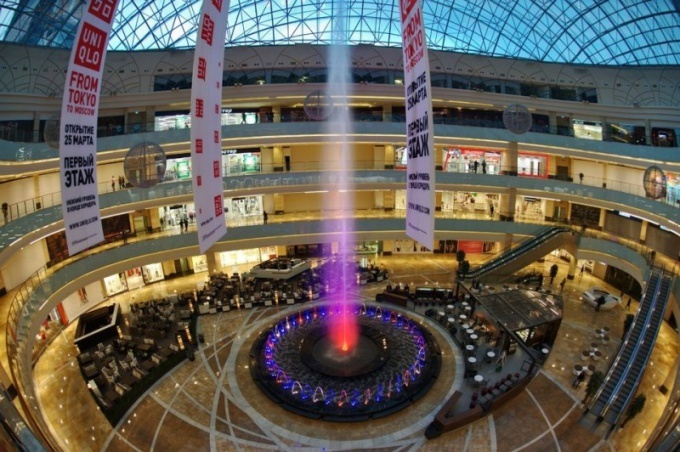 Afimall is famous for its large-scale exhibitions: about 2 years on the 6th floor of the Mall was the display of giant matryoshka dolls. Now it was replaced by the exhibition "Titanic." 3 ways to get to the "APIMELL"
To get to the shopping centre by public transport, you need to take metro station Kievskaya (Filyovskaya line). Because it is the only branch that has a fork, you need to be extremely careful: with the same platform, the train leaving in the direction of two stations "Kuntsevskaya" and "international". In order not to disorient passengers, all trains that go to "Kuntsevskaya", do not declare, but if any part should be up to "International", it will say on the loudspeaker and write on the digital Board, which is located above the track. Trains to the "International" run with large intervals – on average, the wait can lay up to 10 minutes. After the "right" train has been selected, it should pass only one run to the station "Vystavochnaya". But what! Unlike most of the spans between the stations, the path from "Kiev" to "Exhibition" will take about 7 minutes. But to rise from the convenient metro station is designed in such a way that when you exit once you get into the shopping center. To get to the "Afemale" and on a personal car – it is necessary to reach the junction where the SEC (Third ring road) crosses the Krasnopresnenskaya embankment. Private Parking at the entertainment centre there, but underground, and, to the surprise of many, paid. Car Park within 2 hours and will cost 100 rubles/ hour, 3-4 hours – 50 rubles/hour. There is a third way to get to "APIMELL": on the train, which departs from the Belorussky railway station. Fit the train, next to Odintsovo, Golitsyno, Mozhaisk and Borodino, which make the stop at the station Testovskaya. Although the Mall is very close from the railway tracks to get to it is not always easy - due to the ongoing construction on the territory of "Moscow-city". By the way, Afimall is not only one of the most beautiful and meaningful projects, but unfortunately investors, and even one of the most sparsely populated and unprofitable. The development company that funded the construction of the center, Afimall daily visited by 20 thousand people, while the daily throughput of the nearest (in the sense of scope and geography) of a competitor, the SEC "European", is 130 thousand people. Despite this, news of the possible closure of the shopping center has not yet been reported. "Moscow-city" business complex built on the territory of Moscow, in the North-Western part of the city, near the Garden ring. The complex contains several towers which offer great views of the city. On one of these towers was opened observation deck. The observation deck is located at the fifty-eighth floor of the tower "Empire", located on the territory of Moscow city. It was opened on March 21, 2014, and from this point is the constant attention as the Muscovites and guests of the capital. The Playground offers a great view on the Moscow state University, Academy of Sciences, Cathedral of Christ the Saviour, Ostankino TV tower and the adjacent areas of the city. View panoramic, so with this tower already had made many fine photographs of the capital. To get to the observation deck is not difficult, but it can be done only with a guide. Rise to the top is by Elevator, which travels at a speed of about 7 m/sec. During the tour you will learn about Business Centre "Moscow-city" and will showcase the architectural and engineering achievements, which have been used for the construction of the towers. To get to the observation deck, you can either go to the tower "Empire" and try to buy a ticket on the spot, or schedule a tour in advance. Preferred is the second option, since a lot of visitors, and the throughput of the attraction is limited, and you risk to wait a very long time, and some days and did not get up. To register to visit the Internet site http://smotricity.ru. On the main page you'll see the button "place order". Click on it, select the time and date of your visit, enter your contact information. You can also register by phone: 8(499)272-48-46. The ticket price for children is 300 rubles, for adults – 600 p. If you come on a weekend day to 14 hours, the ticket will cost you 400 R. Group visits involve discounts, but the size of them is discussed individually. It is better to call the number listed above. Lookout works both in weekdays and weekend. On weekdays, tours start at 18:00 and end at 23:00, on weekends they are from 11:00 to 23:00. The easiest way to reach Moscow city by metro. You need Filevsky line (the blue line, is located in the North-Western part of Moscow), the branch that ends at the station "international". Walk to downtown as possible from the station "Exhibition center" and from station "international". Address business center "Moscow city" - kozhevnicheskiy pereulok, 7a.